Explorer Brings New Conversion Van Model to Line Up! The all new Mercedes-Benz Metris Conversion Van by Explorer is expected to take the van industry by storm. This Mercedes Conversion Van is a first in the industry and provides many of the features well known to the Explorer line of Conversion Vans. Learn more about this brand new Mercedes Conversion Van. The all new Explorer Conversion Vans feature some great changes and improvements. Not only has Explorer made some improvements, GM has made some upgrades to the chassis as well. The exterior of the Explorer conversion van is available in different styles. Choose from Low-Top or High-Top raised roof models. The new Vista raised roof features automotive glass along the sides of the hi-top roof. This allows natural light into the rear of the Explorer conversion van, providing a more “open” feel to the passengers. The Vista roof adds even more style to the exterior of these Explorer conversion vans. Explorer vans have many paint options available. These paint schemes allow you to express your own personal style. From custom fades to solid colors, you can choose how your van will stand apart from the crowd. See all the conversion van paint options here. Once behind the wheel of a 2016 Explorer Conversion Van, you will notice the familiar comforts such as premium super soft leather seating. 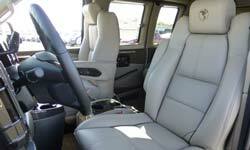 Explorer is known for having the most comfortable seats in the business. As you sit in the driver seat, all the controls are within reach. The steering wheel is fitted with Radio and Cruise Controls. Having the ability to control the radio without having to remove your hands from the wheel is convenient and safe. Since the 1500 chassis was discontinued in 2014, Explorer innovated on the 2500 chassis for 2016 with the addition of the Eaton Ridetech soft ride suspension. This suspension system provides the ride of the 1500 chassis, with the added power and torque of the 2500 chassis 6.0L V8 Engine. This is a major improvement, since the original 2500 chassis can be a bit “bouncy” for those sitting at the rear. With the soft ride suspension, this van drives and rides like a dream. 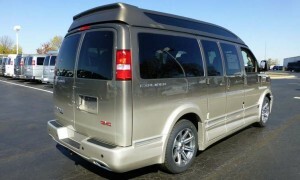 Explorer Conversion Vans feature electronics that entertain while you travel. The cockpit area features a color touch screen navigation system that can show traffic data such as detours and construction zones. Bluetooth connectivity allows hands free texting and voice calls. 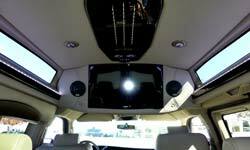 The rear entertainment section features a 29 inch television which can be listened to through the stereo or wireless headphones. 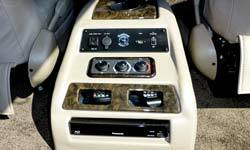 Premium sound components with amplified subwoofer provide great sound throughout the van. Wireless headphones work perfect when passengers are wanting to listen to audio, separate from the driver. 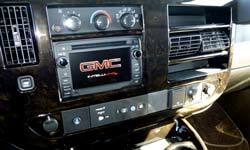 USB Charging Ports are located throughout the van, which makes charging of smartphones, tablets, etc. convenient for everyone in the van. If you like to play video games, utilize the game outlet that is complete with a 110 inverter and HDMI Port. 4GLTE Wi-Fi hotspot turns the 2016 Explorer Conversion Van into a wifi hotspot, providing internet access to everyone in the van. 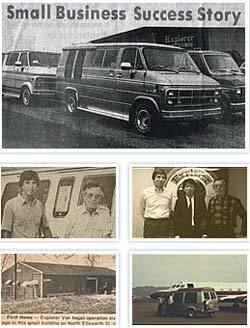 Explorer has been building conversion vans since 1980. 35 years after the first Explorer van was completed, they are still a leading innovator in the conversion business today. In the early years, Explorer started out converting 2-4 vans each week. This number has grown exponentially since then, and continues. Explorer Vans are the fastest selling conversion van models in the United States. 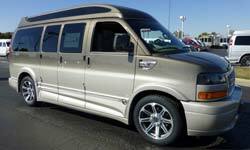 Browse New and Used Explorer Conversion Vans at Dave Arbogast. 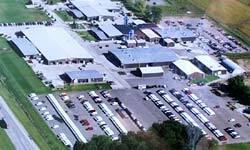 Can’t make it to our dealership in Troy, Ohio? 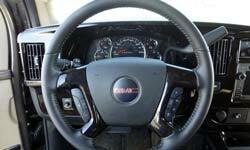 View our inventory of new conversion vans with detailed pictures, descriptions, and videos from your desktop or mobile device. We also have an extensive inventory of pre-owned conversion vans. 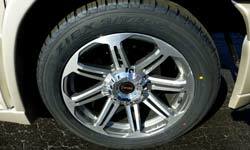 Questions About Explorer Conversion Vans?